You know oatmeal is filling and nutritious, right? But who has time to sit down and enjoy a bowl each morning? 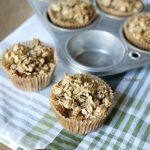 With this healthy recipe for baked oatmeal muffins, your kids will be set with a filling breakfast in the morning. Check out how easy these muffins are to make in this quick video. 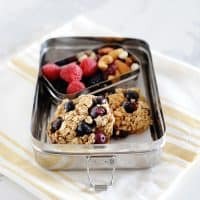 I love the idea of sending my boys out the door to school each morning with bellies full from a nutritious breakfast. The truth is, some mornings it just doesn’t happen. Someone needs to leave early, another slept too late and yet another just isn’t in the mood for his usual peanut butter toast. 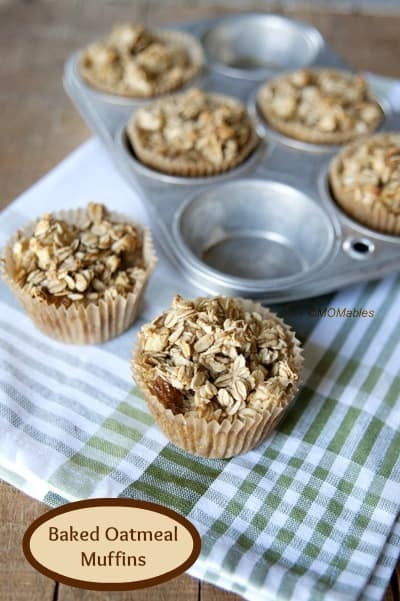 These baked oatmeal muffins are a good answer. 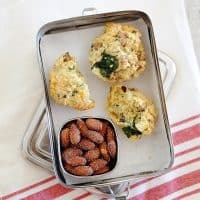 Inspired by the popularity of baked oatmeal, this recipe takes it one step further by baking them in individual muffin tins. 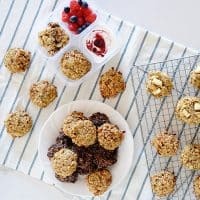 Make these oatmeal muffins for a filling, portable breakfast and freeze leftovers to pull out for another day. All you have to do is pull them out to thaw overnight, or warm in the microwave for 45-60 seconds to reheat. If not eating on the go, you can make them even more decadent by drizzling with warm milk. In a medium bowl, combine the oats, baking powder, salt, cinnamon, fresh fruit (and dried if using). In a small bowl, whisk together the butter, milk, syrup, and egg. Combine wet ingredients with dry. Batter will be very loose and wet. Evenly distribute oatmeal/fruit mix into lined muffin tins. Bake at 375 degrees for 25-35 minutes or until muffins are just golden brown. Bake time may vary depending on size of muffin tins and oven. Allow to cool for a few minutes before serving. If not serving immediately, refrigerate in air tight container. To freeze muffins, cool completely before storing. I made these last night and was thrilled! I followed the recipe and for my fruit, I used 2 very ripe bananas and one cup of raisins. Let the mixture sit for a while, per some of the comments here. Not only were they fantastic, but the house smelled great! Even my hard-to-please husband commented on how good they were. Maybe I should mention that what caught my eye about this recipe was the maple syrup. I get so disappointed when I see the word “healthy” in a recipe and it calls for one (or, even worse, more than one) cup of granulated sugar. Ugh. Also, I didn’t make these for any kids — childless — but I run out the door every morning and eat breakfast at my desk. These are a welcome addition to my routine! Thanks very much, Momables Team! I’m so glad you liked these Denise! These we’re tasty, but not any tastier than microwaved oatmeal, and this took a lot more time (more time than making individual bowls of oatmeal everyday). Awesome recipe! I used Lactose free milk, chopped walnuts and fresh bananas, I also let the mixture sit for 7 mins before baking, so the oats could absorb some of the liquid (thanks Debbie!) turned out great!I’m freezing them to eat each morning as a quick and healthy breakfast!! Baked goods with little or no gluten will generally be crumbly. Adding liquid lecithin will correct the problem. I use 1/2 to 1 tablespoon depending on how much flour you use. Will try soon. Do you have the nutritional value for the muffins?Trying to figure out weight watchers point value. Hubby and I work shift work and have been trying to eat as clean as we can. He’s a big dessert guy but he’s realizing that he needs to dial it back a bit. I love cooking for us so I’m always looking for new things to try. I came across this recipe in an attempt to find a quick and easy sweet-tooth fix that doesn’t pack on the sugar and calories. WOW. I followed the base recipe to a T and added my own little extras (banana, walnut or raspberries or apple, etc.) These turned out better than I could have ever hoped for! I will never go back to store bought muffin mixes, these were perfect and we both LOVED them! They’re great for a quick dessert after a meal or on the go when heading in to work. Thanks for sharing the wonderful recipe. I’ve already made 2-dozen! Awesome!! So happy we could help you out. Keep up the healthy eating! Followed recipe as is used fresh pears and dried cherry flavoured cranberries . My son helped out and ate two as soon as they were cool enough to handle! Thanks for a great recipe to add to his lunchbox next year! Those add-ins sounds delicious. So glad I could help you out! These were delicious and not too sweet. I added sliced almonds and dried cherries. I let the batter sit for a while to absorb into the oatmeal. Cooked perfectly in 35 minutes. The recipe was great. Easy to follow and the muffins are delicious…just maybe a little denser than I’d like. Any thoughts on how they could be lighter? I’m glad you liked them! This muffin recipe is just naturally more dense, but you can try adding a little more baking powder to see if they rise any more. Like several others, I had a sticky mess with this recipe. Not even close to wanting to try it again. I’m sorry Barb! If you do try it again, you could maybe increase the amount of oats and decrease the milk. Love this recipe! I pulse my oats first so they look more like regular muffins, I also cut the maple syrup in half and add extra chopped apples and pecans- recently I added several extra eggs for protein and they still came out great and my boys love them! thanks! Is there anything I can sub the maple syrup for? I have a little one who can’t have sugar. He can have spenda etc. I did the recipe without maple syrup and used frozen blueberries as my fruit, it came out really well. These were great! They’re healthy and convenient. I used coconut oil in place of butter and a cup each of chopped apple and shredded zuchini. I made the batter up the night before so the next morning the oatmeal had soaked up most of the liquid, making it easier to spoon the batter into muffin tins. (I made mini muffins, no papers). Thanks for the recipe! Made these today exactly as directed except that I didn’t use any liners. At 30 minutes the tops were brown but they still didn’t seem done. So I put them back in for another 10 minutes on 325, same issue. Finally after 50 minutes in the oven I had to take them out so that the outsides didn’t completely burn. I have a very powerful chef’s oven and I usually have to reduce the time on my recipes so this was surprising. They are still more like crumb than muffin. I think next time I might lower the temp and cook for longer and/or grind half the oats to make it more like a flour. Layla, I’m sorry these didnt’ come out for you. This chef’s oven is the one in the studio kitchen. In my regular oven they come out the same. They should be baked at 375F not 325. That temperature is too low to heat the old fashion oats through. sorry. Is it okay that I replace the syrup with powder sugar? No. It will change the consistency of the muffins. You need a liquid sweetener. You can use honey. I love baked oatmeal so just tried the muffins. I used ingredients exactly, old fashioned oats etc. the batter was runny and they came out sticking to lining and middle didn’t hold together. I dumped it all in casserole dish to eat as baked oatmeal. What is trick for having them hold together?? I had the same problem so I hope someone can answer your question. Im making these for my 15 month old twin boys. I don’t add any butter or sugar to items I back for them. Is it possible to use coconut oil instead of butter? Banana’s or applesauce instead of sugar? I’ve done that with other recipes with not problems and only ask because people seem to be having trouble with the consistency when changing the recipe. Thanks so much for posting! Definitely coconut oil vs. butter and banana measured 1:1 for sugar. 1/2 Greek yogurt + 1/2 banana worked in my test. I made these with banana and flavored chia and flax seed and added almond butter, also subsituted brown sugar for maple syrup. Healthy and delicious. Sprinkled a few chocolate chips on some to make it feel like dessert! How much brown sugar did you use instead of the maple syrup? To taste, I just poured. They come out great. I’d like to use applesauce as part or all of the fruit, but I’m concerned that it will be too wet. Do you think I can use applesauce without changing the recipe, or do you have any suggestions on how to adjust the recipe for applesauce or other pureed fruit? Adding additional pureed fruit will change the consistency of the recipe. You will have to adjust for the wetness and I can’t advise since I haven’t tested it. I made these and the batter was not thick- it was like oats and liquid. I did sub flax seed for the egg. Mine didn’t really hold together well after being baked, but they’re good as far as taste. Next time I’ll up the cinnamon and perhaps use fruit juice in place of part of the milk and leave out the honey/syrup. Maybe I’ll toss in a little flour too… Will make again for sure though, as this is a great base recipe- I used apples, crasins and walnuts. Mine Too! Would have worked out better just throwing it all in a casserole dish and calling it oatmeal! sorry yours didn’t hold together well Tracy! If you look down the comments some people’s stuck to the paper (opposite problem of sticking together). Try a little longer baking time next time, since all oven temperatures vary. I tried these today, I thought they were great. But my husband thought they were not sweet enough. I used honey instead of maple syrup, do you think that is the reason they were not sweet enough. Thank you. Do you think I could use brown rice syrup next time? yes, instead of maple syrup. I made your muffins and I LOVE them. But I have to ask,how many calories do you think they would each be? 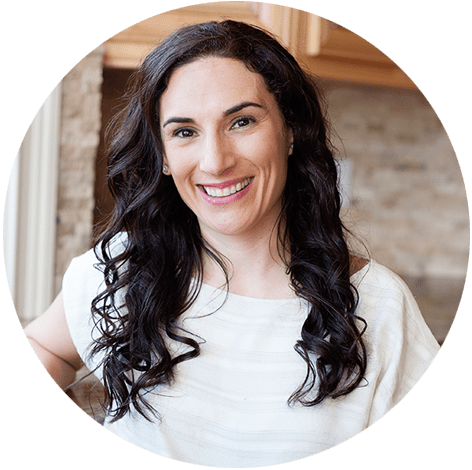 Lizzy, I aim for “real food ingredients” more than calories… you can always calculate in one of those recipe calorie calculator websites. Thanks Linda! I recently began adding carrots too… you can almost add anything to these! You an use parchment baking cups. That’s what I use and they never stick. I am baking these tonight but I was wondering if you have the nutitional value for this recipie. How many calories per serving? I made the muffins last night. They turned out great!!! I used the large parchment baking cups and no sticking at all. I was just wondering if there is a list of the nutritional value and how many calories in one muffin? I have been making these muffins at least once a month for 6 months. My toddler always wants more, more, more! I make them as written, except I make mini-muffins (so I bake them about 13 minutes). I also always have some milk left over in the bowl after filling the muffin tin, but they turn out great! THANK YOU for sharing! I made these with my 2 year old son last night and they turned out really well. DEFINITELY use the foil muffin liners, I had about half foil and half paper, and I will be eating the ones in the paper with a spoon :). I also added more cinnamon (I let my son do all the ingredients and he LOVES cinnamon and loved shaking it in there). Make sure to keep stirring the ingredients together as you distribute the mix as the oatmeal and liquid separate quickly while you put it in the muffin liners. Delicious alternative to other breakfast options and my son really enjoyed helping make them. The batter looked too runny and they did not seem to be baking just right. When the kitchen filled with smoke from the overflowing liquid dripping on bottom I checked ingredients and realized i used quick oats! I used all the right proportions, just the wrong kind of oats…. Can i save them? Thanks for making the note that there was an original reply with quick oats. I asked the recipe developer and she said that you need to increase the amount of quick oats until the “texture” is right. Because “what the texture is right” might be different for all of us, I am going to remove the fact that it will work. I apologize for your frustration with the recipe. I just made these with apple, pear and raisins and they didn’t turn out like a muffin at all. I baked them for 35 mins and let cool for 10 mins. They don’t stay together and are quite wet kinda like regular oatmeal. What did I do wrong? Amanda, did you make any substitutions? The batter is actually quite thick/sticky… not runny at all. The only substitution I used was organic quick oats and not rolled oats. While flavor is the “same” when you cook a bowl of breakfast oats, in baking the quick oats require a lot less liquid. A chef once showed me oatmeal cookies make with Quik oats and others mades with old fashioned, the Quik oats cookies were flat and runny, and the old fashioned were fluffy like they should be. She made them at the same time with the same recipe. This is also true in other forms of baking. I’m sorry your muffins did not turn out this time. They are delicious when made according to the ingredients in the recipe. These look wonderful. I have been looking for an easy, basic recipe for baked oatmeal and I am sure this is it! Will be making these tomorrow with strawberries and chocolate chips. How do you think pumpkin would work in these? I think canned pumpkin would work but add the equivalent amount of extra oats. I made these for my husband to grab and go on his way out the door to work this morning. I added craisins and walnuts and substituted agave nectar instead of maple syrup. My husband LOVED them. He said he could eat them every day! Thanks for the recipe! These look really good! Could I use quick oats, or does it have to be the old fashioned rolled oats? Karen, after a couple of trials quick oats will significantly change the texture of the batter. you are going to have to add extras in order to make the batter ticker. I don’t recommend it. Thanks for the recipe! I just made these today. They tasted great, but they stuck to my muffin liners really bad. Any suggestions? Hi Annie! Mine stick sometimes too.. I find that the “foil” like liners don’t stick as bad. I also make them directly on the muffin pan but i make sure i oil it up well with coconut oil (it’s what I use) because spray will not work. Awesome, thanks! I was thinking about the foil liners. But directly in the tin sounds best, I’ll try that next time. I used apples and raisins and trippled the cinnamon because the firsy batch was a little to blah for me and my daughter. The second batch was delicious! Anyone tried these with an egg substitute? yes, with flax eggs. 1 egg = 1TB ground flax + 3TB warm water. mix until it becomes a paste. Oooo…can’t wait to try these out! Yummy and so healthy! Hello! Your recipe sounds great and I tried it but the cupcakes were quite done after just 25 minutes; I’m wondering if you made a typo? Lizzy, the recipe has been updated. Thanks!